This is a story about a story; one which Grandma makes up for Michael and Hannah and Baby as they sit together looking out over a summer evening garden. She begins, as these kinds of stories do, in time honoured fashion, 'Once upon a long long time ago there was a boy and his sister and their little baby brother who all of a sudden got so very very small that they could leave that house of theirs by a crack under the door - and no one notice.' So long ago that a seed packet, we notice, costs only Id and the boy's shirt - though exactly the same colour as Michael's T-shirt - has long sleeves and a collar at the neck. Once again, more or less, we are back in the time of Ahlberg's childhood, yet also still in the present. 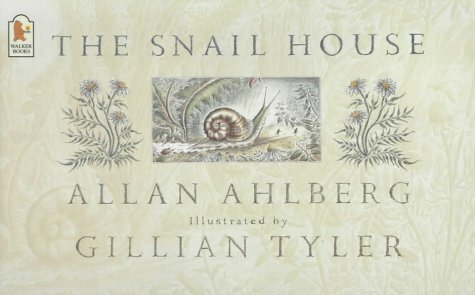 So the boy and his sister and their baby brother have all sorts of magical adventures, living as they do in a little house, fully and charmingly furnished, on a friendly snail's back. They suffer an earthquake (a falling apple) and an attack by a thrush (which, as Michael points out, likes to crack snail shells to get at the occupant); and baby goes off and gets lost, eventually reappearing using a dandelion clock as a parachute. All the time the text never forgets that this is Grandma telling stories in a real garden, with the children chipping in here and there, maybe even shaping the story as they do so. Tyler's illustrations catch the scale of things precisely; both in the sense of taking us down deep into the undergrowth of the flowerbeds, teeming with insects often larger than the shrunken children, and in conjuring up the security of the garden and Grandma's 'mighty arms'. The mood is deeply rural, tranquil and secure, with the colours gently pastoral to match the mood - almost those of a herbaceous border at dusk. The delight is in the detail, the connections between page and page, between words and image. There is a lot to be learned (well, enjoyed) here about the nature of reading, for in this kind of poetic text, narrative is anything but linear.